Microlite20 is an OGL role-playing game containing character generation, combat and rules for magic, monsters and level advancement. It ripped the guts out of d20 leaving just the essence of the game. Skills are much simplified, there are no feats and combat is as simple as it gets. Microlite20 is a trimmed-down, subminiature version of the Primary Fantasy Tabletop RPG SRD rules that has been designed to be quick and easy to play. The goal was to create a simpler game, but one where all of the resources of Primary Fantasy SRD (monsters, spells, adventures and equipment) could be used without conversion. It was designed for the 3.5 SRD but will work with the 3.0 SRD or even the PF SRD. The original rules for character generation, combat, magic and level advancement took up a single sheet of paper (of very fine print), making it great for introducing role-playing to new players, gaming one-shot adventures or tailoring into your own game system. Of course, the Microlite20 quickly grew beyond the original (extremely basic) rules with a number of optional systems and supplemental modules (e.g. lists of equipment and spells) designed to make the game playable without needing to constantly refer to a copy of the SRD. Microlite20 is also the basis for a large number of independent variant games in many genres -- the current (2017) edition of the Microlite20 RPG Collection has just over 2000 pages of Microlite20 based RPGs. 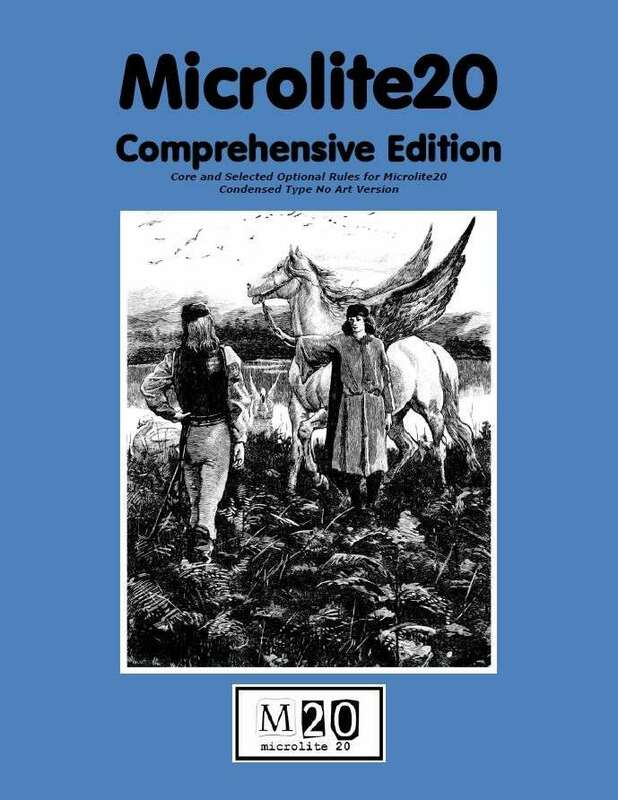 What is the Microlite20 Comprehensive Edition? In its raw form, Microlite20 and its more important optional and supplemental sections are a hodge-podge of pdfs produced by different people and formated however the producer of that section wanted. The Microlite20 Comprehensive Edition takes all this material and combines it in one document -- all formated the same and somewhat reorganized in places to make it easier to use. This Pay What You Want "no art" version is 60 pages. You can see the complete contents of the pdf from the quick preview link above. This Pay What You Want version includes a 60 page two-column letter-sized copy of the rules. This version has no interior art to speak of. The actual rules include the following sections: Basic Rules, Basic Rule Examples, Expert Rules, Equipment, Spell Lists (Magi, Cleric, Illusionist, Druid), Monster List, Gamemaster's Guide, Designer's Notes (explaining the hows and whys of Microlite20's design), Appendix A: Minor Rules Expansions, Appendix B: Microlite20 Martial Arts, Appendix C: Microlite20 Psionics, Appendix D: Rune Magic, Appendix E: Microlite20 Mass Combat, Appendix F: Microlite20 Mecha and Starships, Appendix G: Microlite20 Old School Style, and (of course) a copy of the OGL. Is There a Version With Art?